Size: 1,700 sq. ft. "m/l including Florida Room"
WOW! Bring your clothes & be ready to live in this extra large almost 1,700 sq ft, 1980 Barrington 3/2 perfect for entertaining friends & family or relaxing after a hard day living your Florida lifestyle on the nearby beaches of Fort Myers Beach, Sanibel & Captiva or in the beautiful, friendly gated Buccaneer Estates. Buccaneer Estates has 2 heated swimming pools, a hot tub, club house, sauna, two exercise rooms, putting green, shuffleboard, hospitality house, billiards, horse shoes and multiple lakes for your enjoyment. This house has a large lanai with a wet bar (hot & cold running water), a kegerator & a small fridge for soft drinks. There is a 10x10 shed/laundry room with NEW Admiral Washer/Dryer set & a 4x10 added storage room. 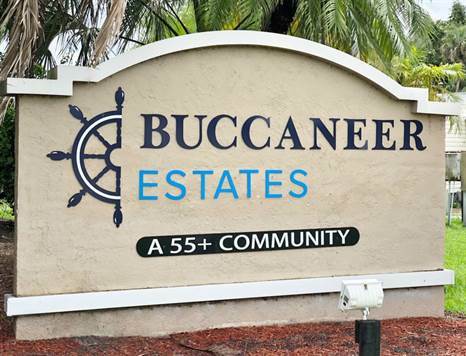 Located in friendly Buccaneer Estates with a little over including Florida Room 1,300 sq ft and an open, easy flow makes relaxing and sharing with friends and family very easy. This home is waiting for you with all major kitchen appliances, washer, and dryer, low maintenance, large carport, 3 spacious bedrooms, the master has a private bath, and the 3rd bedroom can be used as a den. BONUS ITEMS include NEW screens for the Florida Room, NEW central A/C in 2016, NEW finished flooring, NEWly sealed roof, NEW cabinet hardware, sweet, sweet NEW light fixtures and ceiling fans. Lot rent is approximately $700 and includes lawn care and use of all amenities. Other fees are a pass-through tax, water, sewer, and trash and add approximately $80 to monthly lot rent bill.